An excellent, rousing live album with great, bassy sound quality, covering many years of Paul Weller's career, concentrating around the "As Is Now" album. Check out "Come On Let's Go" for live vigour and verve. There is a great "live" gig atmosphere on the album too. Indeed it is one entire gig from London's Alexandra Palace. "Wild Wood" is played quite straight on here, but is enhanced by a beautiful violin. Tracks like "Peacock Suit", "The Changing Man" and "The Weaver" burn with the flame of the title. I can never get enough of "Broken Stones", either. There is a great crowd reaction during the bass, drum and organ interplay at the end. 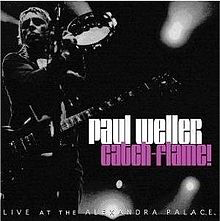 Weller certainly is on fire on this recording, but then he always is. He never gives a poor show. He feels it is his duty to give his audience his best. You have to admire him for the fact that, even if he is in a bad mood, it usually spurs him to an even better performance. The Jam's "In The Crowd" gets an airing too, complete with a Steve White drum solo! "From The Floorboards Up" just rocks with a manic, riffy intensity. You also get The Style Council's "Long Hot Summer" and "Shout To The Top", which are certainly interesting to hear.